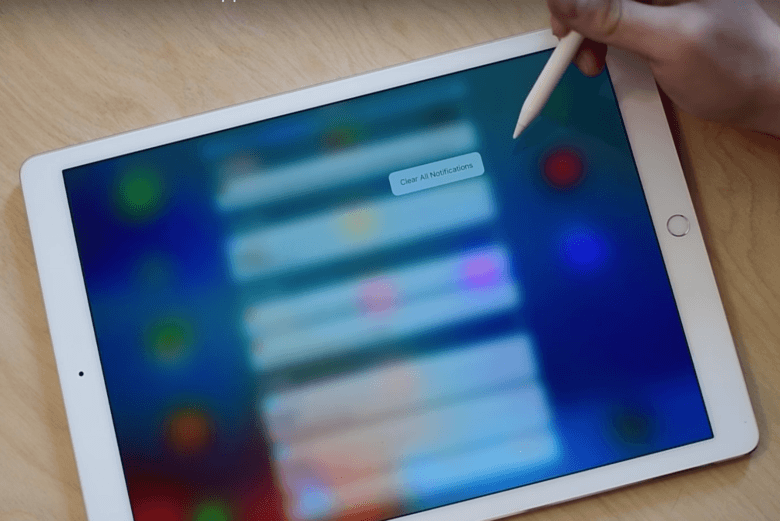 3D Touch gestures could be coming to your iPad Pro this fall with iOS 10. Developers testing Apple’s second beta have discovered a new deep press action for Apple Pencil, which lets you quickly clear all alerts in Notification Center. 3D Touch is one of my favorite iPhone features. I use it all the time to access home screen shortcuts for various apps, to preview images and webpages sent to me in Messages, and more. The only problem is, it’s still only available on iPhone 6s and iPhone 6s Plus. That could change when iOS 10 rolls out this fall. The update allows for 3D Touch gestures on iPad Pro when using Apple Pencil — without the pressure-sensitive display hardware found in the latest iPhones. You can see this in action in the video below. You can’t do much with the deep press on iPad Pro right now — this is the only gesture found in iOS 10 beta 2 — but Apple could have plans to do more with it before iOS 10 goes public. And when you think about how many Apple Pencils that could sell, that seems totally plausible. We’ll be watching iOS 10 beta 3 closely to see if more pressure gestures are added for iPad Pro.